Constructed in 1957, Lincoln Park’s open air Chess Pavilionis both an architectural and sculptural work of art. As North Avenue Beach had been a popular summer gathering place for chess players since the 1930s, it was an obvious choice for the location of the pavilion. Architect Maurice Webster designed the modernistic structure of concrete and Indiana limestone which is comprised of two tiers of chess boards sheltered by a wing-like overhang. It has bas-relief components, incised carvings, and three dimensional sculptural elements that were created by Boris Gilbertson (1907-1982). The Bishop of Chess Pavilion is carved into the low wall. 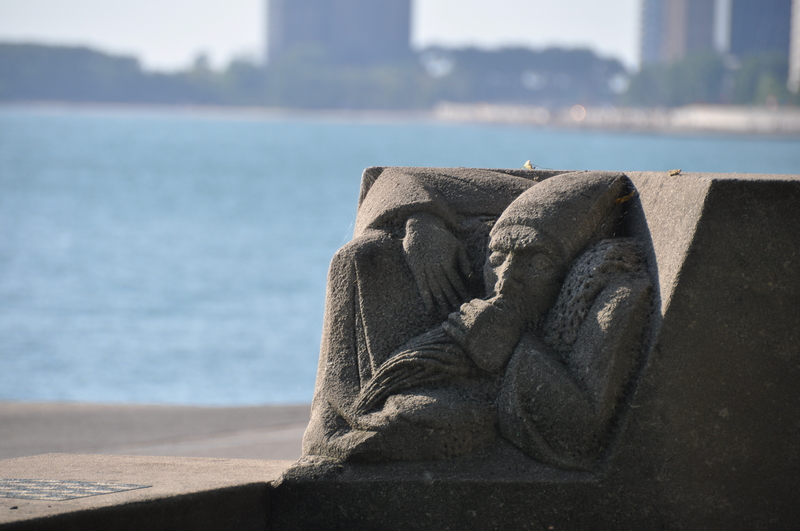 For Lincoln Park’s Chess Pavilion, Gilbertson created the original game boards, a wall of incised carvings representing all of the different pieces in chess, bas-relief carvings of the bishop and the knight, and five-foot-tall, freestanding king and queen chess pieces. In 1957, the Chess Pavilion received a Citation of Merit from the Chicago Chapter of the American Institute of Architects at its Civic Pride luncheon. This entry was posted in Amusement, Architecture, Chicago, Historic Landmarks, Life. Bookmark the permalink.